Gold rose $11.50 in holiday thinned trade on Monday and climbed over $25 more to as high as $1759.90 in New York today before it fell back off a bit in late trade, but it still ended with a gain of 2.14% from Friday’s close.Silver gained $0.41 on Monday and rose to as high as $34.442 today before it also fell back off a bit, but it still ended with a gain of 3.56% from Friday’s close. Euro gold rose to about €1329, platinum gained $58 to $1686, and copper gained 11 cents to about $3.83. Gold and silver equities rose about 3% by late morning and remained near that level for the rest of the day. Tomorrow at 10AM EST brings Existing Home Sales for January expected at 4,630,000. Oil rose on worries about Iran and relief over Greece. “Euro zone finance ministers agreed a 130-billion-euro ($172 billion) rescue for Greece on Tuesday to avert an imminent chaotic default after forcing Athens to commit to unpopular cuts and private bondholders to take bigger losses. The U.S. dollar index pared some of yesterday’s losses as the yen fell in a search for higher yielding assets. Treasuries remained lower after today’s 2-year note auction sold at a high yield of 0.31% with a bid to cover of 3.54. The Dow, Nasdaq, and S&P rose in early trade on optimism about Greece, but they then fell back off in afternoon trade and ended mixed on worries about higher oil prices. Among the big names making news in the market today were CME Group, Alibaba, Wal-Mart, Home Depot, Teva, Macy’s, and UBS. “Greece managed to secure itself a bailout which takes the problem off the radar screen of hedge fund managers for the time being so it was back to "RISK ON" in a big way in today's trading session. Between China's 50 basis point lowering of its Reserve Ratio Requirements for its banks yesterday and today's money printing to throw at the Greek debt problem, it was "Happy Days are Here Again" as the equity market perma bulls wasted no time in bidding the price of stocks higher while the inflation camp decided to buy nearly anything that moved on the commodity exchanges with the grains being the notable exception to the party. This buying resulted in copper and silver both EXPLODING higher while gold managed to finally take out both the $1740 level and the $1750 level in one fell swoop. Resistance - forgettaboutit! It evaporated with this rush of hot money into the markets again. This is money that has been sitting on the sideline waiting to see how the European sovereign debt situation was going to unfold. Once that particular stumbling block was removed out of the way, the path of least resistance in this pitifully low yield interest rate environment was higher for risk assets. Notice on the chart that gold has finally managed that CLOSE over $1750 which it needed to set up a run towards $1780. The trick for the yellow metal will be to see if it can HOLD TWO CONSECUTIVE CLOSES over this important technical resistance level. 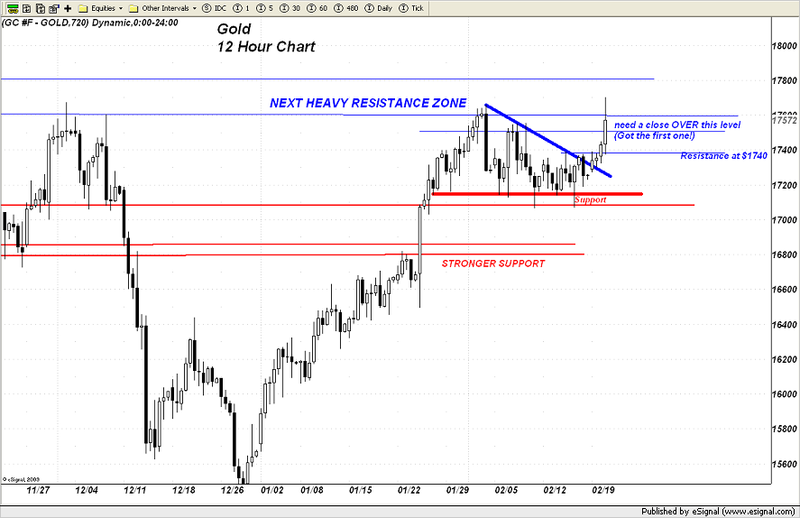 If we see additional follow through buying in tomorrow's session, gold will go on to test the upper boundary of the zone noted on the chart as "Heavy Resistance Zone". That upper boundary is $1780 where the price capping bullion banks will be ready to attempt to stem the advance. If they fail there, we are going to see a handle of "18" in front of the gold price relatively quickly. Downside chart support is initially near $1740 followed by $1720. Let's also look at silver which finally managed to CLOSE ABOVE $34. This is the first signal that the consolidation pattern of the last few weeks is close to resolving itself. If silver can take out the initial resistance level noted on the chart, it will very likely embark on a visit of significant resistance centered between $35.00 - $35.35. 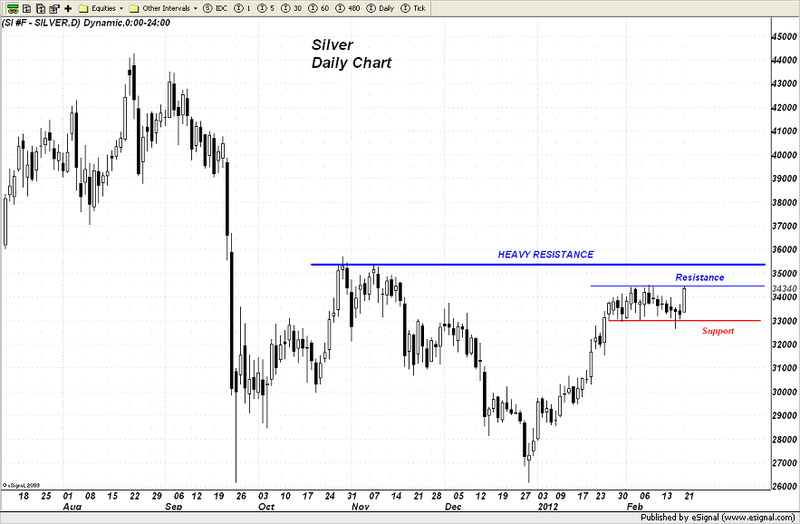 I would like to see a close above this level, preferably above $35.50 to indicate that silver is headed to $40. Downside chart support is at the bottom of the recent consolidation pattern near $33 which is where buyers have been busy accumulating the metal for the last three weeks. Here is a picture of the fallout coming from this nearly unlimited money printing that seems to be the order of the day (issuing new debt to pay off old debt) - look at what is happening to longer term interest rates. 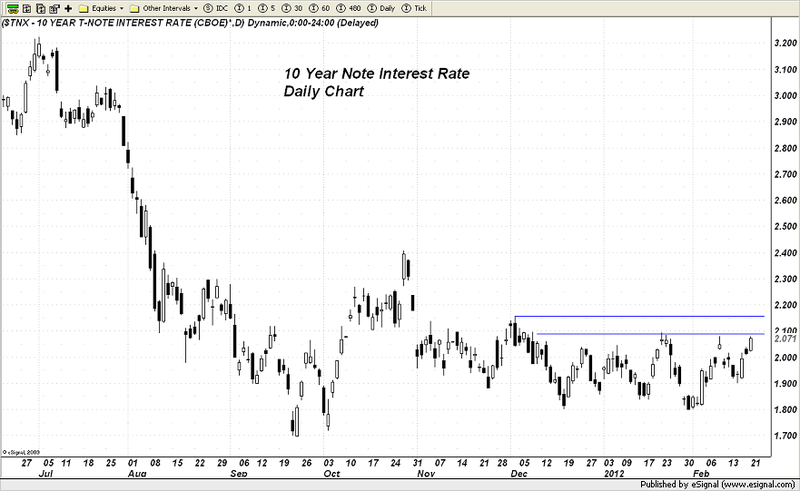 While still low by historical standards, the yield on the 10 year note is now above 2% and moving towards 2.10, the upper boundary of the recent trading range. If interest rates were to break out strongly to the upside, the multiplier effect on the gargantuan amount of US debt would begin having a keen impact on the US fiscal condition. The US monetary authorities want to have their cake and eat it too - by that I mean that they want to be able to artificially keep short term interest rates at ridiculously low levels to encourage consumer borrowing as well as keeping the cost of servicing the US debt load low. However, if the Central Banks, particularly of the West, are going to keep this insane game of kicking the can down the road by basically adulterating their currencies, then those who lend their respective governments the money are going to demand higher rates of interest to compensate them for the fallout of all this, namely increasing risks of inflation originating from the debauchment of their currencies. 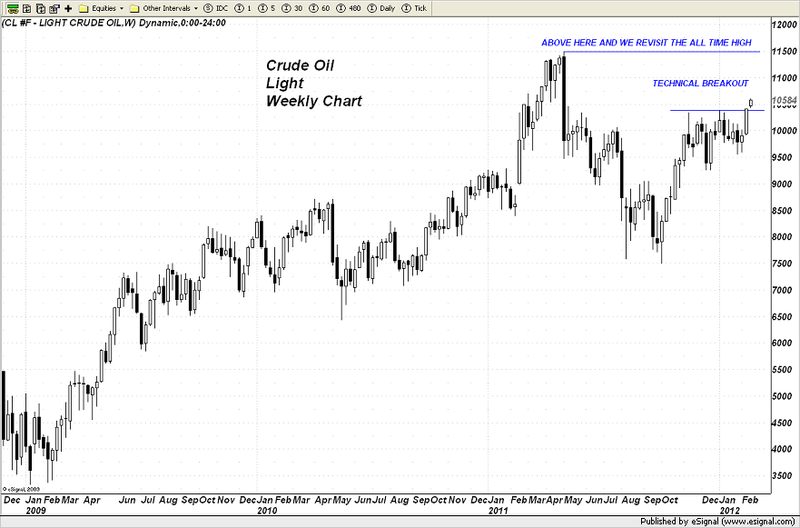 Crude oil has firmly broken out to the upside and is trading well above the key $105 level. Gasoline is going beserk to the upside. It looks like we are going to see $4.50 gasoline in most cities across the nation by Memorial Day and possibly $5.00 at the rate which it is soaring. 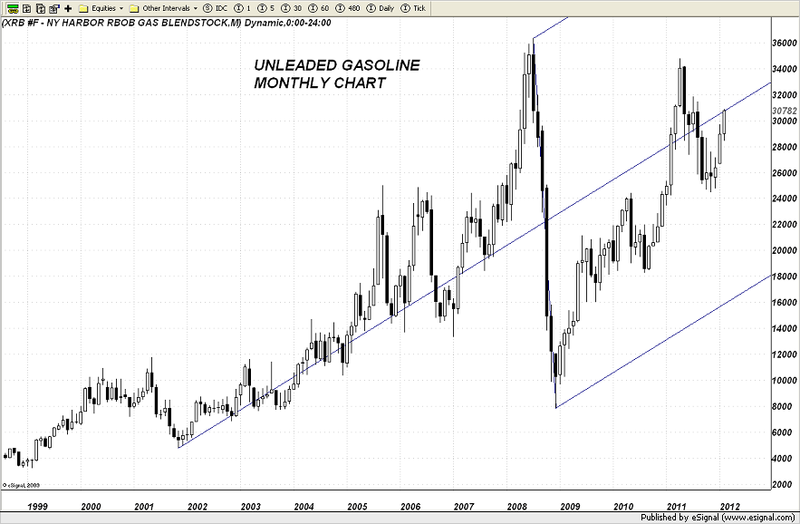 Gasoline is at a key crossroads on the long term monthly chart. If it pushes through this level near $3.08 - $3.10, odds will then favor it running to $3.40 which will the last level of chart resistance before it revisits its all time high. The American consumer is now reaping the combination of Obama's stupidly inept energy policies along with the fallout from the Federal Reserve's near zero interest rate policy with a wild card kicker of Iranian tensions. What has me extremely concerned is that we are NO WHERE NEAR the PEAK DEMAND period here in the US which kicks in as we near summer and the driving season. NovaGold’s (NG) spin-out, Agnico-Eagle’s (AEM) project milestone, Midway’s (MDW) drill results, Brigus Gold’s (BRD) operations update, and Hecla’s (HL) silver-linked dividend and 2011 results were among big stories in the gold and silver mining industry making headlines today.